Justin Hendrickson joined the military with a desire to see the world. He enlisted in the Navy as a corpsman shortly after high school and first deployed to Afghanistan in 2004, serving with the 1st Battalion, 6th Marines. On May 6, 2005, while deployed to Iraq with the 3rd Battalion, 8th Marines, Navy PO3 Hendrickson and his unit were conducting a resupply mission to a forward outpost in Al Anbar Province, Iraq, when his vehicle drove over an improvised explosive device (IED). PO3 Hendrickson sustained shrapnel to all of his extremities in the blast, resulting in the eventual amputation of his right leg. Once he returned to the United States, Justin endured numerous surgeries and rigorous therapies. 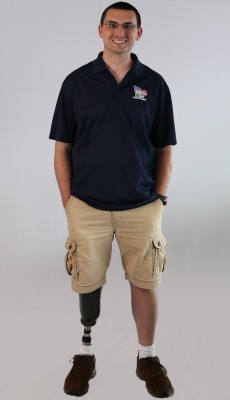 Through hard work and determination, he was walking on prosthetics within three months and discharged from outpatient at Walter Reed Medical Center in September 2005. In the years following his injury, Justin earned his bachelor’s and master’s degrees, and more importantly, met and married his wife Jennie. Together, they enjoy traveling, fishing, scuba diving, and spending time with their dogs. In the fall of 2016, Justin and Jennie received some devastating news that altered the course of their future – Jennie was diagnosed with brain cancer. The couple has taken this challenging time in stride and they are hopeful about Jennie’s prognosis. “We live life to the fullest every day and enjoy it,” Justin says. Though Justin and Jennie have an unwavering optimism about their future, there are some unavoidable challenges they presently experience in their current home. Because Justin is active, there are days where his prosthetic causes his residual limb to be painful, so he prefers to rest in his wheelchair. However, his current living situation is not accessible, so Justin either has to use crutches to get around or he is limited to one room. A specially adapted custom Homes For Our Troops home with an open floorplan will give Justin the freedom to access every room easily. In this safe environment, Justin will be able to perform routine tasks on his own and look after Jen as she fights her illness. Most importantly, Justin and Jennie say the home will allow them to spend quality time with each other. “I don’t think we could ask for anything more,” Jennie says. Justin and Jennie are choosing to build their home outside Pittsburgh to be close to medical care and jobs. Justin says he is humbled and thankful for HFOT’s donors and supporters who take the time out of their lives to help others. “This home will allow us to live as normal of a life as we can. It’s an opportunity for freedom and safety,” he says. Community Kickoff held on May 19, 2018.